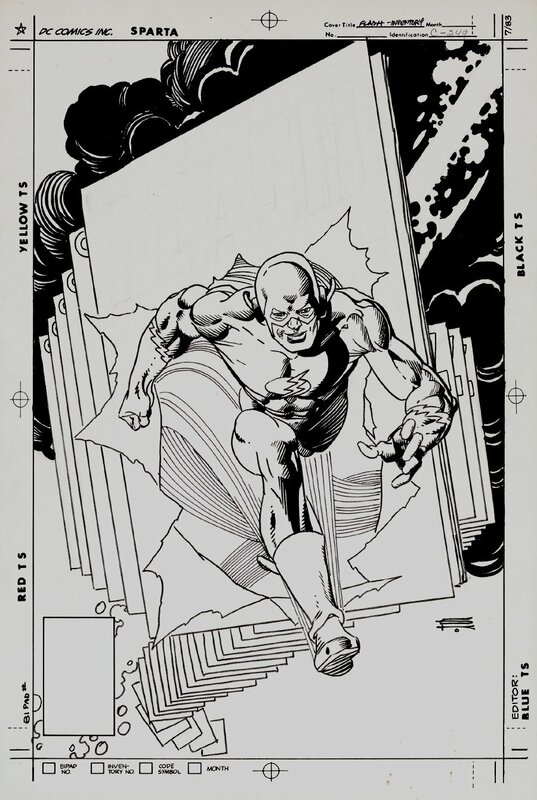 Check out this outstanding pseudo-infinity cover, which was penciled and inked by the great Gil Kane. This nice cover was inked in permanent marker which has NOT FADED at all almost 35 years ago! I have not been able to find a published image for this so we are selling this as unpublished, but if anyone finds out this IS PUBLISHED, please let us know... THANKS! Cover features a GREAT 3-D image of THE FLASH running right at the reader as he BURSTS through the literal pages of the comic book story! Just a great cover which has a DC copyright stamp on back from 1984 but it could have been drawn earlier! ALL art on our website (including this one) are able to be purchased with VERY fair time payments, and trades are always considered towards "ANY" art on our website! Just send us an email to mikeburkey@aol.com and we can try to work something out.